The FAQs have been integrated directly into the new support site and can either be accessed via the search function or over the left menu tree in the tab "FAQ" of each sub-menu. #102030 - Why it’s not possible to change the value of the analogue outputs of the PCD2.W605/W615/W625 card, if the PCD2.W6x5 card is plugged in a PCD2.C1000 or PCD2.C2000 extension? #102029 - Why can the PCD7.LRxx-P5 IRM room controller as S-Bus master, not read/write datas (inputs and outputs) from S-Bus slave devices via S-Bus? #102028 - Why do the 0 to 10 V analog outputs of the PCD3.W800 cards 'freeze' to a random value during operation and cannot be controlled by the user program? #102027 - It’s possible to order the red, 6-pole terminal for the PCD1 E-Line devices as spare part? #102026 - Why the RS-485 S-Bus communication between the PCD master and the slave does fail sometime, if FW 1.28.20…1.28.33 is used? #102025 - Which operating systems and relational database servers are supported for Saia-PCD Supervisor installations? #102024 - For the PCD7.LRxx-P5, what are the differences between the firmwares FW 1.10.00 and FW 1.10.07? 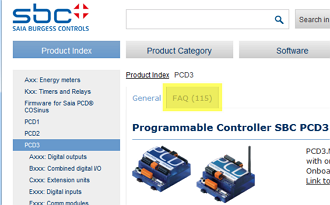 #102021 - How to know if the PCD integrated BACnet stack is running? #102020 - Why the PG5 2.1, 2.2 or 2.3 update manger application is no more working and it’s not possible to download files from PG5 update manager server? #102019 - It’s possible to display the texts on the Saia PCD Supervisor in different languages? #102018 - Shall I use PG5 2.3, PG5 2.2, 2.1, 2.0 or PG5 1.4 for my next project? #102016 - Does the PCD support the MP-Bus light protocol and it’s possible connect up to 16 Belimo devices to one MP-Bus line? #102015 - It’s possible to connect more than 8 MP-Bus devices on a MP-bus line (F180 or F280/F280 card)? #102014 - Why do the output of the PCD2/3.W6x5 not deliver stable signals? #102013 - Why after an download of a PG5 2.2.230 project to the PCD, where BACnet revision 14 is used, the application program on the PCD doesn’t work correctly and have a randomly unexpected/unwanted functionality? 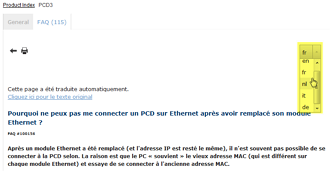 #102012 - Why after the crash of the PC the platform daemon for the Saia PCD Supervisor doesn’t restart automatically? #102008 - PG5 2.1 and PG5 2.2 with S-Bus communication library 2.7.370, why the S-Bus communication on the master PCD stops either after a certain time or after the download of the program? #102007 - Inputs of a W525 could be perturbed from an other input? #102005 - It’s possible to use the ‘old’ PCD7.F1xx module (not the PCD7.F1xxS) on PCD1.M2 and PCD2.M4x60 CPU’s? #102010 - What are the differences between the COSinus firmwares FW 1.28.11 and FW 1.28.37? #101282 - Shall I use PG5 2.3, PG5 2.2, 2.1, 2.0 or PG5 1.4 for my next project? #102023 - Why does suddenly the Microbrowser-App on my iOS Apple device or Android device not work anymore, error message ‘unable to Verify App’ is shown on the device? #102022 - Why the P-Web panel PCD7.D44WT5R crash/reboot if the user access the setup menu? #101820 - What are the differences between firmware 1.16.69 and COSinus FW 1.22.61? #100224 - How can I capture telegrams of only one station with Wireshark? #100535 - How to filter captured traffic in Wireshark? #102009 - PG5 2.1 and 2.2 with E-Line S-Bus communication library < 1.2.110, why the S-Bus communication on the master PCD stops either after a certain time? #101921 - What are the differences between the COSinus firmwares FW 1.22.48 and FW 1.24.69? #101987 - What are the differences between the COSinus firmwares FW 1.24.67 and FW 1.26.31? #101539 - What are the main differences between OPC server version 2.02.18.03 and 2.02.16.14? #101990 - What are the differences between E-Line firmwares FW 1.04.07 and 1.08.06? #101743 - Are the PCD7.F1xxS fully compatible with the "old" systems? #102004 - On a PCD7.D5xxxWTA010 why a warning message appear at the beginning of a restore from a factory image? Search the FAQ with the search field.